Miklós Boskovits (1935–2011), “Agnolo Gaddi/Saint Andrew and Saint Benedict with the Archangel Gabriel [left panel]/shortly before 1387,” Italian Paintings of the Thirteenth and Fourteenth Centuries, NGA Online Editions, https://purl.org/nga/collection/artobject/2 (accessed April 24, 2019). The close resemblance between the passage with the blessing Christ child seated on his mother’s lap and the fresco by Agnolo Gaddi now in the Museo di Pittura Murale in Prato suggests that the two paintings are close in date, presumably contemporary with the painter’s documented activity in Prato in the years 1391–1394. For the fresco in Prato, see Miklós Boskovits, Pittura fiorentina alla vigilia del Rinascimento, 1370–1400 (Florence, 1975), fig. 260; for the documents in question, see Giuseppe Poggi, “Appunti d’archivio: La Cappella del Sacro Cingolo nel Duomo di Prato e gli affreschi di Agnolo Gaddi,” Rivista d’arte 14 (1932): 355–376; Bruce Cole, Agnolo Gaddi (Oxford, 1977), 63–65. This is the incipit of the Rule of the Benedictine Order; see Sancti Benedicti Regula, in Jacques-Paul Migne, ed., Patrologiae cursus completus: Series Latina, 221 vols., Paris, 1844-1864: 66:215-932. Report dated January 9, 1989, in NGA conservation files. Brigitte Klesse pointed out that the same pattern, with minor modifications, was also used in Gaddi’s triptych now in the Berlin gallery (no. 1039); see Brigitte Klesse, Seidenstoffe in der italienischen Malerei des 14. Jahrhunderts (Bern, 1967), 316. The wings of the seraphim are decorated using sgraffito to reveal the gold underlayer. The edges of the figures’ robes are decorated with mordant gilding. The reconstruction was based on marks on the panel as well as research into comparable structures still intact. See Mary B. Bustin, “Recalling the Past: Evidence for the Original Construction of Madonna Enthroned with Saints and Angels by Agnolo Gaddi,” Studies in the History of Art: Conservation Research 57 (1996–1997): 35–65. The altarpiece must have been treated prior to 1988, probably in the first half of the twentieth century, because the crockets on the top side of the frame, which are visible in Lionello Ven­turi’s reproduction, had already disappeared prior to the 1988 treatment. Cf. Lionello Venturi, Pitture italiane in America (Milan, 1931), no. 52; Lionello Venturi, Italian Paintings in America, trans. Countess Vanden Heuvel and Charles Marriott, 3 vols. (New York and Milan, 1933), 1: no. 63. Also during this treatment, some of the fold lines in the Virgin’s robe were recreated. Duveen Brothers. Duveen Pictures in Public Collections of America. New York, 1941: no. 24, as by Gherardo Starnina. Cole, Bruce. Agnolo Gaddi. Ph.D. dissertation, Bryn Mawr College, 1969. Ann Arbor, MI, 1977: 73-75, 85, 208, 209. Walker, John. National Gallery of Art, Washington. Rev. ed. New York, 1984: 73, no. 16, color repro. On the original decoration of the frame, cf. Mary B. Bustin, “Recalling the Past: Evidence for the Original Construction of Madonna Enthroned with Saints and Angels by Agnolo Gaddi,” Studies in the History of Art: Conservation Research 57 (1996–1997): 50–64. The fashion of covering the gable zones of altarpieces with pastiglia ornamental motifs in relief before they were gilded began to spread from Orca­gna’s shop in the second half of the Trecento. The proposal was accepted by Raimond van Marle, The Development of the Italian Schools of Painting, vol. 3, The Florentine School of the 14th Century (The Hague, 1924), 565–573, and some other authors in the following decade. Gemäldegalerie, Berlin, no. 1039; see Bruce Cole, Agnolo Gaddi (Oxford, 1977), 76, 84–87. Attributed to the school of Agnolo Gaddi by Osvald Sirén, Don Lorenzo Monaco (Strasbourg, 1905), 41, it was reinstated as an autograph work by Gaddi himself by Bernard Berenson, Italian Pictures of the Renaissance: A List of the Principal Artists and their Works with an Index of Places (Oxford, 1932), 213. For the lost inscriptions, see Dillian Gordon, The Fifteenth Century Italian Paintings, National Gallery Catalogues (London, 2003), 197 n. 3. We have no secure documentary evidence for the dating of the frescoes in question. Roberto Salvini, L’arte di Agnolo Gaddi (Florence, 1936), 31–85, considered them to predate the decoration of the Castellani chapel, but the more recent art historical literature in general indicates 1387 as the terminus ante quem for the execution of the cycle; Sonia Chiodo, “Gaddi, Agnolo,” in Allgemeines Künstlerlexikon: Die bildenden Künstler aller Zeiten und Völker, ed. Günter Meißner, 87 vols. (Munich, 2005), 47:113. The fact is that while Benedetto degli Alberti in his testament dictated in 1377 indicated Santa Croce (where his family had the patronage of the cappella maggiore) as the place where he wished to be buried, he made no mention of the realization of the frescoes in this chapel in the codicil added to his will ten years later, when he made testamentary provision for the funding of other artistic enterprises; for the text of the codicil, which also cites the relevant passage from the testament of 1377, see Luigi Passerini, ed., Gli Alberti di Firenze: Genealogia, storia e documenti, 2 vols. (Florence, 1869), 2:186–194. It seems logical to infer from this evidence that at the time the codicil was added the mural decoration of the chapel had already been finished and that everything was ready for Benedetto’s burial. In my view, however, the stylistic evidence suggests a later, or more protracted, date for the very demanding enterprise of frescoing the chapel, which could have begun c. 1385 but could well have been prolonged for years due to the political setbacks that struck the family. Accordingly, the present writer suggests the date 1385–1390; Miklós Boskovits, Pittura fiorentina alla vigilia del Rinascimento, 1370–1400 (Florence, 1975), 297; and Bruce Cole, Agnolo Gaddi (Oxford, 1977), 21–27, c. 1388–1393. In dating the frescoes in the choir, various stylistic features should be borne in mind: the more complex and crowded compositions; the more elaborate language of gesture; the numerous genre details; and the tendency towards a softening of the forms, modeled with light tonal passages of chiaroscuro. These features all suggest that the cycle of the cappella maggiore in Santa Croce is stylistically more advanced than the decoration of the Castellani chapel (executed, as we have seen, sometime after 1383), but no doubt antecedent to the frescoes in the Cappella della Cintola in Prato Cathedral, for which the painter received payments in 1392–1394. See Giuseppe Poggi, “Appunti d’archivio: La Cappella del Sacro Cingolo nel Duomo di Prato e gli affreschi di Agnolo Gaddi,” Rivista d’arte 14 (1932): 363–369. Report dated January 9, 1989, in NGA conservation files. Brigitte Klesse pointed out that the same pattern, with minor modifications, was also used in Gaddi’s triptych now in the Berlin gallery (no. 1039); see Brigitte Klesse, Seidenstoffe in der italienischen Malerei des 14. Jahrhunderts (Bern, 1967), 316. The reconstruction was based on marks on the panel as well as research into comparable structures still intact. 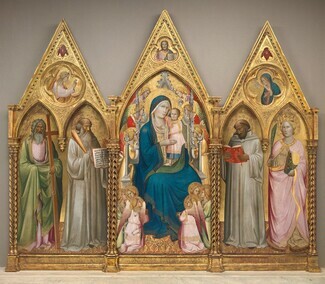 See Mary B. Bustin, “Recalling the Past: Evidence for the Original Construction of Madonna Enthroned with Saints and Angels by Agnolo Gaddi,” Studies in the History of Art: Conservation Research 57 (1996–1997): 35–65. The altarpiece must have been treated prior to 1988, probably in the first half of the twentieth century, because the crockets on the top side of the frame, which are visible in Lionello Ven­turi’s reproduction, had already disappeared prior to the 1988 treatment. Cf. Lionello Venturi, Pitture italiane in America (Milan, 1931), no. 52; Lionello Venturi, Italian Paintings in America, trans. Countess Vanden Heuvel and Charles Marriott, 3 vols. (New York and Milan, 1933), 1: no. 63.